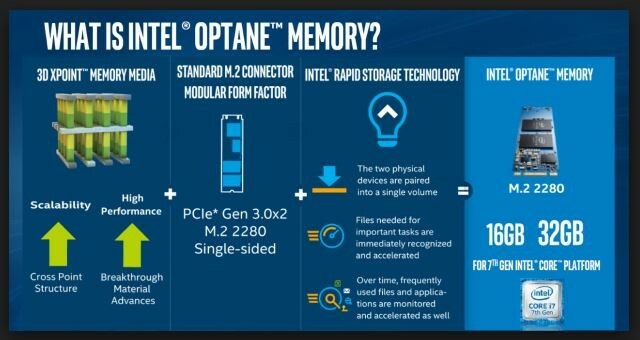 SOLVED: What is Intel Optane and Does Optane Run Faster Than SSD? We explain and demonstrate what Intel Optane is, what you need to run it, and if it will really improve your PC’s performance. Intel Optane is an accelerator for your hard drive. Intel Optane is stick of non-volatile memory, which means it does not get wiped clean when you power it off like regular RAM, that fits into a M.2 slot on your motherboard to provide a large cache for your hard drive. Today, Intel Optane comes in 16GB or 32GB sizes. In other words, it is new very fast memory configured as an SSD Cache using the a replacement software to Intel Rapid Storage Technology (RST). Does Intel Optane Run Faster Than an SSD? Technically Intel Optane is VERY fast stacked memory named “3d xpoint” that runs at PCIe speeds which is about 3 times faster than SATA speeds, so technically Optane does run faster than SSD’s. However, it is so small and so expensive that Optane really only makes sense when you are trying to accelerate a SPINNING disk. A 16GB and 32GB Optane modules sell for about USD$45 and USD $75 respectively. For USD $90 you can buy a high quality 240GB SSD. Does Intel Optane Really Improve Performance of Spinning Disks? In a word, definitely. Intel Optane makes a substantial performance difference to traditional spinning disk systems. Again, the problem is the price. 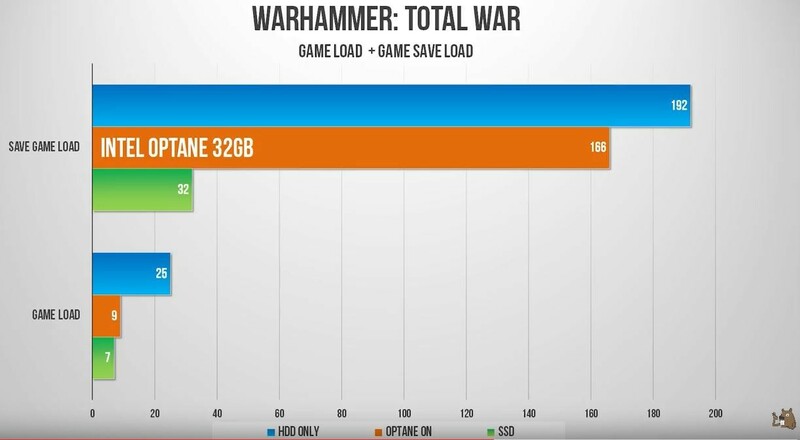 For the money you would be much better off just buying an SSD. 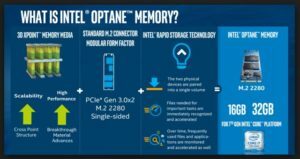 What Are the Hardware Requirements for Intel Optane? If you have a new Dell 7050, 5050, 3050, 5020, 7450, 5720, 3620, 3420, 8920 or Aurora R6 PC, THIS Dell page gives your more detail about Intel Optane. What Are the Problems With Intel Optane? Scale: The Intel Rapid Storage Technology software does NOT tell you how much of the Optane you have used or even if it is ‘full’. This means you have no means (pun intended) to figure out how much Optane you should buy. 16GB or 32GB is just a feeling. Technology: While Optane’s stacked memory is crazy fast, you need to have all the latest and greatest hardware to make it run. See the Intel Optane Hardware requirements list above. Complexity: While it is not very hard to add in an M.2 Intel Optane card, it is one more step and one more thing to go wrong. I have no idea what would happen to the files on your spinning disk if the Optane ‘Disk’ became defective. My guess is it would be pretty ugly as your spinning disk may now only contain SOME of the files it needs to run the Operating System and your programs. Intel Optane is just another, albeit better, attempt at adding RAM to spinning disks. What is new is that the RAM is much faster and sits outside of the harddrive. For my money I would simply buy an now common “Hybrid Disk” or SSHD. SSHD’s only cost a few dollars more than plain spinning disks. Take a look at this video to see the difference between SSD, SSHD and traditional hard drives. SOLVED: What is Windows 10 Team? I don’t think that we would have to worry about it becoming defective. It doesn’t have any moving parts and the only way that it can fail is over multiple writes. This kind of memory will mostly be used for reading and not for writing, which means that it should last for at least as long as our computer.